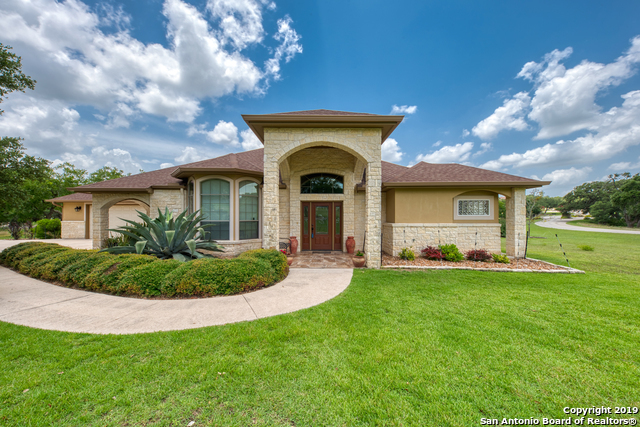 All MOUNTAIN SPRINGS RAN homes currently listed for sale in Canyon Lake as of 04/20/2019 are shown below. You can change the search criteria at any time by pressing the 'Change Search' button below. "Beautiful Texas Hill Country 1-Story Home on 1.16 Acre Lot! Open Floor Plan W/ Stone Fireplace, Art Niches, Built-In Shelving, Tile Flooring in All Living Areas. Gorgeous Kitchen W/Granite Counters, Gas Cooking, large Island & Breakfast Bar, Study has Built In Book Case , Master Bedroom with a Luxurious Bathroom, Granite installed recently, not in photos, attached Sitting Room or can be used as Exercise Room, Circular Drive, & Over-Sized 3 Car Garage! Relax on the Covered Patio W/Custom Bar and"
"1 Story home on 1.09 acre lot. 2800+ sf on 1 level. Open floor plan with stone fireplace. Custom kitchen cabinets with granite counters, large island. Luxurious master bathroom with large closet. Foam insulation and double pane window for energy efficiency. Covered patio & 2nd stone patio with outdoor fire-pit & sitting area. PEC electricity & solar panels, power not used is sold to PEC & reflected as credit on electric bill." 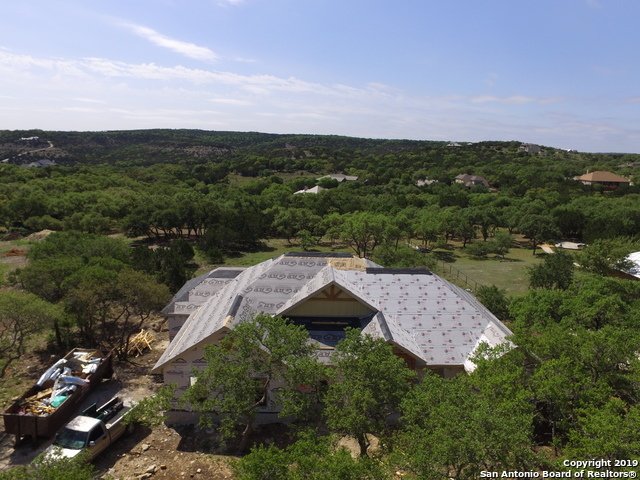 "Exceptional Hill Country views from your private deck that overlooks a valley. 3/3/3 Brick and Stone home by Sierra Classic sits on a private gated cul-de-sac and backs up to trail that leads to 85 acre nature reserve, guaranteeing your privacy. Large master boasts french doors to enjoy expansive views, dual head shower, dual vanities and garden tub. Kitchen features double ovens, 5 burner gas range, copper sink, european faucet, R/O water sys. Splendid media room and Open floor plan. 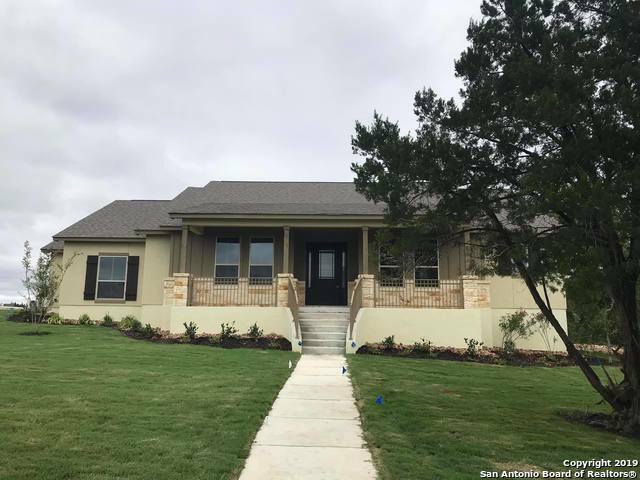 Owner is A"
"Blanco Valley Homes New Home is ready for MOVE IN!!..! This design boast a very open floor plan that opens to large family/Dining Rooms... the split plan has the Two secondary bedrooms, second bathroom, along with a powder bath, study or optional 4th bedroom!! !, Spacious Master Bedroom Suite , large utility room with sink, cabinets, and room for Freezer, 2 car Swing garage....covered rear patio!!!! One of a Kind lot!!!!!!" "Blanco Valley Homes Ready for Move in!!! This design boast a very open floor plan that opens to large family/Dining Rooms... the split plan has the Two secondary bedrooms, second bathroom, along with a powder bath, study or optional 4th bedroom!! !, Spacious Master Bedroom Suite , large utility room with sink, cabinets, and room for Freezer, 2 car Swing garage....covered rear patio!!!! One of a Kind lot!!!!! Landscape Package with this home!" "AMAZING SINGLE STORY CUSTOM HOME IN MOUNTAIN SPRINGS RANCH IN CANYON LAKE. *2 Car Garage *Covered Porches *Granite Counters *Private Master Suite *Dual Master Vanities *Garden Tub *Walkin Master Shower *Private Office (Possible 4th Bedroom) *Pantry *Oversized Utility Room *Ceiling Fans *Open Floor Plan. A MUST SEE!"